RSS Feed for keyword: "black bear pictures"
The American Black Bear is found only in North America and it is estimated that there are approximately 750,000 that live in the forests. They can be found as far south as Florida and northern Mexico and as far north as forests grow in Alaska and Canada. The black bear is probably one of the most popular species of animal that are referenced throughout the world in ancient and modern literature, songs, legends, mythology and songs. Most children learn about black bears through books, stuffed animals and stories and consider them to be large furry friends. They should also be taught of the dangers that could surround the black bear in its natural environment especially when a mother and her cubs are involved. Interesting Photo galleries related to "black bear pictures"
A cute black bear peers out from behind the long grass in British Columbia, Canada. 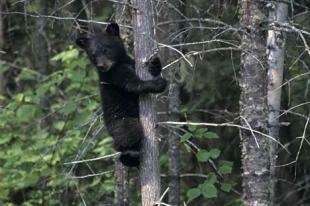 High up in a tree a little black bear cub waits alone for the return of its mother in British Columbia, Canada. ...Continue gallery information: Like many animals, they rarely attack unless they are cornered, threatened or wounded. Humans are becoming more tolerant of the black bear and as each day passes, we learn more about them and how to live in the same world with them. They were once considered very dangerous and were killed when spotted. 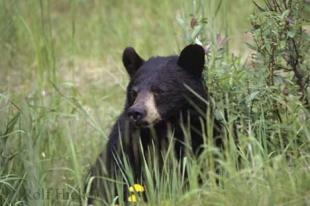 Most of the black bears in North America do not die from natural causes but from human related causes. People are building homes farther into the black bears environment and It is up to us to learn to understand and tolerate them if the black bears are to have a long future. Our collection of black bear photos will give you a better idea of how the black bear lives in the wild. Our Black Bear Pictures are mostly taken in Alberta, British Columbia and the Yukon in Canada as well as in Alaska.